Category Archives: Clarke, Arthur C.
This timeless, succinct sci-fi classic is a must read for anyone who loves sci-fi. For those who shy away from sci-fi, it could be a light-hearted tryst into the future since it’s heavy on straight-forward detail and not terribly long. It’s a scientific experience, not high drama, and this short film created by film students might pique your curiosity. It’s more of an illustration or “trailer” for the book, at only 3 and a half minutes, but it does embody the awe that the book makes us feel. 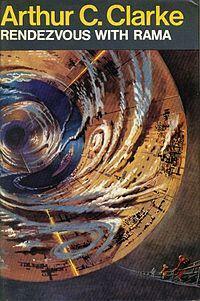 Apparently Morgan Freeman has been trying to make Rendezvous with Rama into a movie. I sure hope he succeeds. This book was a truly wonderful experience after reading so much Heinlein. It was my first Clarke book, but even though, I could tell that he and Heinlein are absolute polar opposites in their writing styles and content. Heinlein’s copious dialogue, over the top personality quirks, and political opinions are tiring over time. He seems to put his two cents in wherever it will fit into a story. Clarke, on the other hand, is light on drama and personality, and heavy on straight forward information and scientific realism. This is a book without human drama, instead filled with human “history” (future history) and significant detail about a fascinating scientific phenomenon. 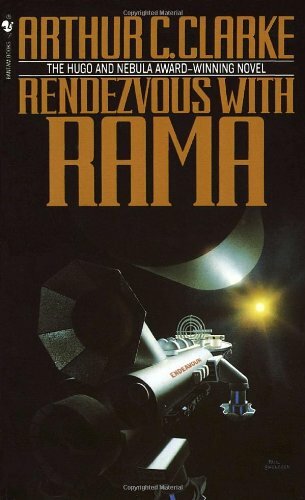 Rendezvous with Rama highlights the moment in human history when we have our first encounter with an alien civilization. No aliens actually appear in the book but we get beautiful glimpses of a civilization with technology far surpassing ours that is traveling in a manner we do not understand, and whom we may never meet. Don’t get me wrong, there are human characters and we hear about their lives to some extent, which are very different than ours, both in function and philosophy, but if you need a break from the endless drama of the average fiction book, look to Arthur C. Clarke.